Manufacturer of a wide range of products which include pharmaceutical jacketed tank, ss jacketed tank and jacketed tank. 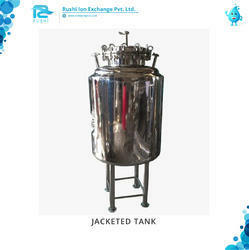 With our rich industry experience and knowledge, we are engaged in offering high-quality Jacketed Tank. This tank is manufactured by utilizing optimum quality stainless steel material under the strict guidance of skilled professionals with the aid of reverse osmosis technology. In order to ensure its corrosion prof nature, the material of this tank is coated with epoxy powder. Moreover, our provided Jacketed Tank is used for mixing and blending the milk, water, juice and another type of liquids easily. In order to manufacture Stainless Steel Jacketed Tank in compliance with the international quality standards, our experts use the best quality stainless steel and high-end technology. Also, this tank is checked on various quality parameters by our quality experts. This tank is available in various specifications at market leading price. Looking for “Pharmaceutical Jacketed Tank”?